CU CHI - The area northeast of here known as the Citadel buzzed to the tune of mini-guns, crackled with small arms fire and rumbled with APCs as infantrymen, mechanized units and choppers combined fire power to crush an already bewildered and scattered enemy force. The aggressors were believed to be elements of C-3 Company of the local Trang Bang Viet Cong Battalion plus a rear service section and an unknown engineer unit. THE ACTION, which began with several sightings by Stinger gunships and a Centaur Light Scout team, was centered approximately two miles southeast of Trang Bang. 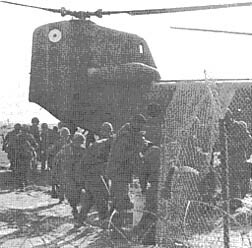 Immediately after the first engagements, elements of the 2d Battalion, 12th Infantry were air-lifted into three of the hotspots. On-line sweeps produced enemy bodies and equipment. Units from the 1st Battalion (Mechanized) 5th Infantry Bobcats also aided in the fighting. Company D White Warrior Specialist 4 Johnny Arnold of Memphis, Tenn., described the scene: "There was an AK-47 and all of one man's equipment thrown on the ground by a tree. He must have really been in a hurry to get out of there." Private First Class James Brown of Rockford, Ill. added: "The equipment we found hadn't been hidden at all." A TOTAL OF 33 enemy soldiers fell to the combined effort. Private First Class James Arline, Suffolk, Va. described yet another location by commenting, "One body was just outside a tunnel. He must have been running for it when the gunships got him." In addition to the 33 body count and a rallier to the government of Vietnam, the action produced the destruction or capture of 12 AK-47s, two RPG Launchers, one camouflaged sampan and other miscellaneous equipment. 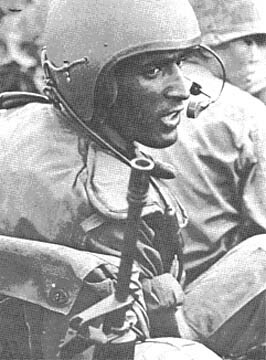 Warrior Commander Lieutenant Colonel Burton J. Walrath of San Francisco, Calif., complemented the Stinger gunships by stating, "Gunships definitely made the day for us." Walrath added, "By aggressively seeking out the enemy we have again pre-empted his plans. This was obviously a new unit in the area. A combined arms team of helicopter gunships, infantry and mechanized units brought the VC into battle on our terms." When the sun goes down and the tide goes out may be a good time to beat your feet in the Mississippi mud back in the World, but in Vietnam it's time to be alert, especially if you're on bunker guard. Keep in mind that the number of hours you spend on guard during your entire tour are few compared to what you could lose by being careless. DEROS. Do it the safe way. On behalf of the Military Assistance Command, Vietnam, I extend my congratulations to the 25th Infantry Division on the 28th anniversary of your activation on October 1, 1941. Since your arrival in Vietnam in December, 1965, the men of the Tropic Lightning Division have added new and inspiring chapters to the military heritage of the 25th Infantry. During the past year, NVA forces have made many attempts to gain a stronghold in your tactical zone. Each attack has been successfully repulsed and, combined with your offenses, has resulted in 13,736 enemy killed and countless enemy casualties. The long list of achievements added to your already commendable record, has contributed significantly to the progress made against the enemy. Your contributions to the Republic of Vietnam's pacification program are also commendable and are helping to provide both security and a better life to the Vietnamese people. During operation "Colors Up" you surpassed your goal by bringing 52, instead of 35, select hamlets within the security of hamlets within the security of the Government of the Republic of Vietnam. Through your outstanding MEDCAP program in which you treated more than 121,000 Vietnamese, you have gained the respect and confidence of the Vietnamese people. I salute you as worthy members of the United States team in the Republic of Vietnam and wish you continued success in future operations. I note with pride the laudatory remarks of General Abrams. I feel a sense of humility when I review the accomplishments of those who have marched beneath our colors. I am deeply honored to head the column of those who are now creating the current chapter of Tropic Lightning history. Your mettle has been tested; you have met each challenge; you are men of success in this great endeavor. The recognition which General Abrams has made of our past accomplishments must inspire us to increase our efforts and our professional effectiveness and thereby to hasten the day of the enemy's complete collapse. TAY NINH - A two-inch hole in the ground led sharp-eyed 2d Battalion, 22d Infantry soldiers to an enemy cache that included enough supplies to stock a Viet Cong drugstore chain. Specialist 4 Jerry Buckner of Danville, Va., spotted the pinhole that enabled Triple Deuce's Charlie Company to find the intricate tunnel complex that housed the cache in the Boi Lo Woods. TIPPED OFF to the presence of what turned out to be a two-and-a-half ton cache, the Tropic Lightning soldiers had run several futile sweeps through a rome-plowed area of the woods before Buckner, a radio-telephone operator, made the key find. With the general location of the cache established, Private First Class Thomas Humphries of Medford, Ore., found a second stockpile. Meanwhile, the hole Buckner found was enlarged, and Staff Sergeant Booker Jefferson of Louisville, Ky., an Alfa Company, 65th Engineers NCO, went in, finding medical supplies piled along the walls of a bunker, with large quantities of penicillin, bandages and surgical supplies. Then Triple Deuce's Private First Class Lawrence G. Jose of San Francisco, Calif., went in to join Jefferson and found out what "spider hole" means. "I GOT THE old man's .45 and a flashlight and went in," Jose said. "I went into the tunnel about 50 or 60 meters before I spotted three big spiders, yelled and started backing out. I didn't mind the chance of running into VC so much, but man, like I don't big spiders, and those were big ones." "Those tunnels are really well built. We've been driving our APCs through this area a lot lately, and remember, they weigh about 12 tons, even though there's water standing all over, the tunnels were dry." Despite the size of the complex, it showed evidence of being well-planned, added Sergeant Robert Cleveland of Heartville, Ga.
"AT FIRST IT looked the tunnels went all over, but they were well-organized, large and fairly easy for a smaller man to move in," Cleveland said. Inspired by the Americans' find, a local Popular Force Company from Khiem Hanh District, working the sweep with Triple Deuce, turned up a cache of its own, filled with weapons. In all the Allies turned up five caches in the area, finding mostly medical supplies but also weapons and food in eliminating what must have been a VC mini-shopping center. ...And a Partridge in a Peer Tree? If you're getting short and are from Connecticut, Delaware, Illinois, Louisiana, Massachusetts, or Pennsylvania, you'll want to know how to apply for the cash bonuses those states offer Vietnam veterans. DELAWARE ($20 for each month of foreign service, $300 maximum) - Veterans Military Pay Commission, 1224 King Street, Wilmington 19801. ILLINOIS ($100 flat rate for persons wno have received the Vietnam Service Medal) - Illinois Veterans Commission, 221 West Jefferson Street, Springfield 62704. LOUISIANA ($250 flat rate on proof of service in Vietnam between July 1, 1958 and end of hostilities) - Louisiana Department of Veterans' Affairs, Vietnam Bonus Division, Fourth Floor, Old State Capitol, Baton Rouge 70801. MASSACHUSETTS ($300 flat rate for at least six months of service in Vietnam since July 1, 1958) - Office of the State Treasurer, Bonus Division, 100 Cambridge Street, Boston 02202. PENNSYLVANIA ($25 per month of Vietnam service, $750 maximum) - Department of Military Affairs, Commonwealth of Pennsylvania, P.O. Box 415. Harrisburg 16108. "I realize that many of our young fraternity-minded officers do not always read regulations, but 'The Alpha Incident' (the title of an article previously published in Newsweek) is a misnomer. There is not now, nor has there ever been an 'Alpha' company in the United States Army. "Prior to July 1, 1956, there was an 'Able' company. Since that date there have been 'Alfa' companies. There are linguistic reasons for such spelling of the first letter of the phonetic alphabet - ask a Frenchman or a German to pronounce 'alpha.'" Newsweek's reply read; "Army regulation 105-31 lists the phonetic alphabet as follows: Alfa, Bravo, Charlie, Delta, Echo, Fox-trot, Golf, Hotel, India, Juliet, Kilo, Lima, Mike, November, Oscar, Papa, Quebec, Romeo, Sierra, Tango, Uniform, Victor, Whiskey, Xray, Yankee, Zulu." Would You Buy A Used Tank From This Man? IT WOULDN'T be a good idea, since you probably couldn't fit it in your hold baggage anyway. But he most likely won't try to sell you one in the first place. What he will do, though, is give you news about the 25th Division, maybe an interview with a friend of yours and some good music. He's Specialist 4 Jim Talley, one each, proprietor of "Lightning 25", Tropic Lightning's own radio program. Listen to it every Sunday from 11:30 to 11:45 pm on AFVN. Private First Class Daniel E. Workman of Company A, 2d Battalion, 34th Armor Dreadnaughts, has been added to the Tropic Lightning Combat Honor Roll. Workman, a medic, was with his company on a reconnaissance operation Sept. 4 when it ran into a numerically superior enemy force. During the initial contact, the Dreadnaughts' lead tank was struck by two rocket-propelled grenades, fatally wounding the tank driver. Braving intense hostile fire, Workman moved to the driver's compartment of the damaged vehicle to move his fallen comrade to a secure position. Returning forward, Workman spotted several injured men lying in the embattled area. With complete disregard for his own safety, he rushed through the enemy kill zone and administered life-saving first aid to the wounded. Then, realizing that there was no landing zone for a medical evacuation helicopter, Workman, in full view of the hostile force, cleared the area of undergrowth, enabling the aircraft to land. Returning forward still again, Workman worked through a heavy barrage of enemy fire as he carried several of the casualties to the waiting helicopter. His actions were responsible for saving several lives. CU CHI - A landmark in the history of the 3rd Battalion, 13th Field Artillery (The Clan) was reached recently when the unit fired its 700,000th round in Vietnam. The ceremonial event took place at the Clan's Battery A located at Fire Support Base Patton II. Division Artillery Commander Colonel Dan D. Stedham pulled the lanyard of the M109, 155mm self-propelled howitzer firing the historic round. 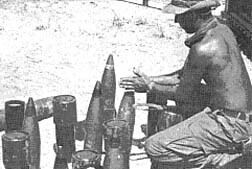 The projectile, a high explosive round carrying a point-detonating fuze, was fired on the command of the Clan operations officer, Major Reinhold Kraft. 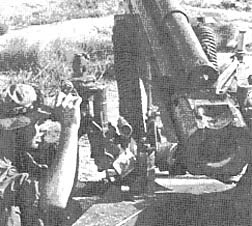 The first round fired by the battalion in Vietnam came on Apr. 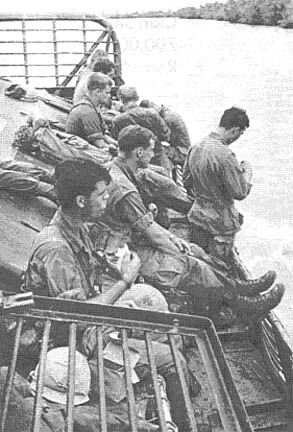 4, 1966, just two days after the Clan arrived at Vung Tau. The 700,000 rounds fired since then by The Clan's 155mm and eight-inch guns represent more than 80,000,000 pounds of hardware. TRUNG LAP - Two American reporters came here recently to look into the outstanding success achieved by the combined operations of the 2d Brigade of the Tropic Lightning Division and the 49th Regiment of the Army of the Republic of Vietnam since they began co-operation in August. Colonel Nguyen Van Chuyen, 49th Regiment commander, disclosed just how successful the campaign has been in terms of facts and figures. The conference was dominated by the two reporters, both from the Washington Post, nationally syndicated columnist Joseph Alsop and David Hoffman. ALSOP: Can the VC still recruit guerrillas in the small hamlets? CHUYEN: Yes. But the replacement is very slow because the US and ARVN forces have had many combined Medical and Civic Action programs. Also the RF-PF forces have gone into the hamlets and explained to the people the advantages of supporting the National Government. ALSOP: What is the main enemy unit contacted in this area and the nearby Ho Bo Woods? CHUYEN: The 268th Regiment Viet Cong Force. ALSOP: What is the troop strength of this regiment? CHUYEN: Before the 1968 Tet Offensive, this regiment numbered 1200 men. After the offensive, it had about 600 men. Right now it probably has only about 300 men left. HOFFMAN: Are NVA soldiers used as guerrillas in this area? CHUYEN: Yes. The VC can no longer recruit villagers from the hamlets so the NVA soldiers have to be brought in to aid the VC regulars. HOFFMAN: Are the U.S. 25th Division troops being replaced by ARVN soldiers? CHUYEN: We are working joint operations on a daily basis. The 2/49th has not replaced the American 2d Battalion, 14th Infantry, but works to supplement its forces. The 2/49th is another maneuver element in this area of operations. ALSOP: Are the RF-PF forces strong enough to replace the ARVN garrison forces as the ARVN battalions become maneuver elements? CHUYEN: The Regional and Popular Forces have proven themselves capable of protecting their hamlets. In the past two months we have had only one attack on an RF-PF post and our men killed over half the platoon-sized attacking force. CU CHI - The 65th Engineer Battalion, continuing to perform unspectacular but vital tasks necessary to the success of an infantry division, has been battling two seasonal enemies - rain and mud - since the onset of the monsoon season. From Fire Support Base Crook near Nui Ba Den to Fire Support Base Chamberlain near Duc Hoa, the engineers are hauling hundreds of loads of laterite to toughen road surfaces, putting in dozens of culverts to drain rice fields and building bridges to span severely flooded sections of road. ONE BRIDGE was constructed recently south of Bao Trai by elements of the Whiskey Fifth's Echo Company bridge-building specialists. A 20-foot section of dry span was built in less than two hours after demolition teams from sister Delta Company blew a gap in the road to allow swift drainage of a flooded field. The project, under supervision of Captain Richard W. Hoover of Canton, Ohio, and Staff Sergeant Clifton M. Anderson of Spokane, Wash., is typical of many performed by the engineers. Slogging through knee-deep mud and waist-high water, the engineers lifted dry span components over the swift current flowing through the gap. "LAY HOLD: heave," Anderson shouted, directing his men as they assembled a floating bridge. "You can't lift it by looking at it." While lines of Vietnamese lined up on both sides of the gap, eager to try the span, a five-ton truck crossed over it to settle the bridge. 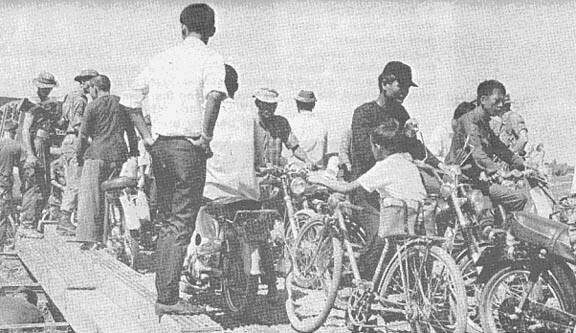 Then droves of motor bikes, bicycles, and pedestrians met each other face to face in the middle of the span as it experienced its first traffic jam. Minutes later a resupply convoy crossed the bridge and proceeded down the road, a road that would have been impassable an hour before. CU CHI - Need an air mattress? A candy bar? A cold drink? Bet it comes on a resupply convoy. Ammunition, water, food and clothing - virtually anything needed to fight and survive in a forward location has to move through an often unappreciated network of channels and processes. It takes time, coordination and most of all persistent, sweaty hard work. An assortment of helicopters and vehicles are daily laden with necessities of existence and moved through 2/12 space. 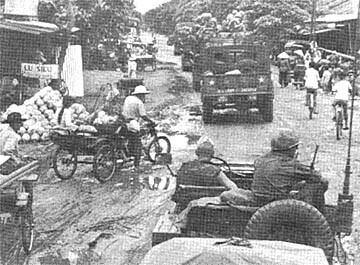 THE BATTALION'S forward headquarters at Fire Support Base Pershing and at the reconnaissance platoon in Trang Bang get their daily bread by road convoy. The trucks and jeeps are loaded up with the needed supplies every day and move out, lights on, to the fighting men. It's harder to get to patrol bases Dees and Lorence, but with the help of Chinooks and slicks from division aviation units, Warriors stationed at even the most remote hardspots can expect something every day. Whether its ordnance or sustenance, the Warriors can count on their resupply team to provide it. IF THERE'S WATER around, the Wolfhounds will find it. This swamp near the Vam Co Dong River provided only a minor obstacle for them. CU CHI - "At times it may seem that we're growing webbed feet," said Captain Frank Smith of Columbus, Ga., "but river operations are a part of our strategy to choke off enemy infiltration across the river." 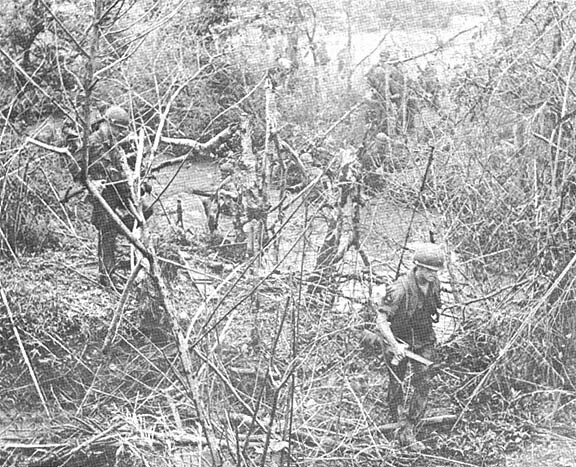 Bravo Company Wolfhounds of the 2d Battalion, 27th Infantry, are working in conjunction with elements of the Vietnamese Navy on the Vam Co Dong River, 35 miles northwest of Saigon. "The Viet Cong stepped up their activity along the river," continued Smith, "so we found it necessary to counteract with our force." Working in platoon-sized elements, the 3d Brigade troopers board small river boats, then insert at a predetermined point along the shore, move through heavy mud and deep canals, searching for the enemy. "I believe that the added mobility of the boats make us a potent force in striking out at the enemy," said Smith. "We also are working off the small PBRs for our night operations. The fire support that the boats can give is astounding. During one operation, the water-borne Wolfhounds chased off 15 NVA and captured rations, utensils and a sampan. Later in the day, as they were heading back to the Sugar Mill complex, a new rallier to the government was flown in to direct the Lightning soldiers to members of his old squad. The eight Viet Cong were routed from the security of their underground sanctuaries by the infantrymen. Boatswain's mate 3d Class Marvin Schlueter of San Antonio, Tex., who is advisor to the Vietnamese Navy with the RAID 71 Advisory Team, said of the Wolfhounds, "These troops are as fine as any I have seen on these boats. They are real professionals in every sense of the word." KEEP THE WEAPONS high, keep them dry. Water in your boots is one thing, water in the barrel of your weapon another. Through long experience, the Wolfhounds have learned the value of protecting their equipment. 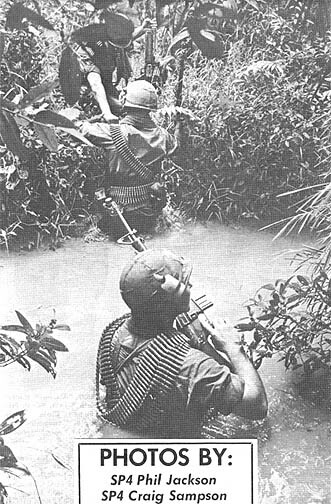 A MACHINEGUN crew wades across a canal near Cambodia (left). The assistant helps his gunner while an ammo bearer cautiously crosses behind them. THIS COULD have been Wolfhounds landing at Guadalcanal in 1943 (above), but it was Vietnam in 1969. 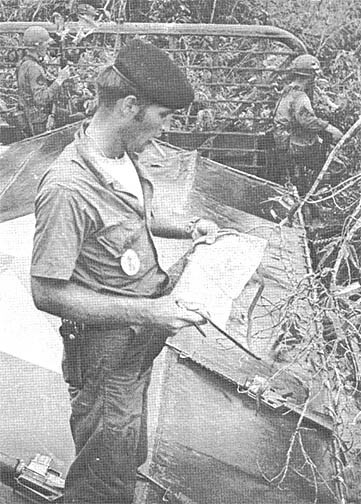 BOATSWAIN'S MATE 3d Class Marvin Schlueter of San Antonio, Tex., an advisor to ARVN sailors, checks his boat's position on a map. Cautiously moving through, over and into soggy terrain, Wolfhounds patrol near enemy infiltration routes. It may mean damp socks for the American soldiers, but for the North Vietnamese and Viet Cong troops who are having more and more trouble finding a place to hide, it means still more running. 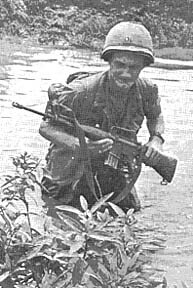 A 2/27 soldier takes the big step off into the marsh. IT MAY LOOK like a pleasure cruise, but it's really 2d Battalion, 27th Infantry soldiers getting as much rest as they can on their way to an operation along the Vam Co Dong River, 35 miles northwest of Saigon. The Wolfhounds made the most of the trip on the Vietnamese Navy patrol boat by bringing out their lunches. CU CHI - There are a few people at the Fire Brigade's 2d Battalion, 14th Infantry, Golden Dragons who believe in ghosts. But they do not believe in reincarnation, at least the reincarnation of one familiar figure. The old-timer has been here a long time, since January, 1966, has one purple heart from a direct RPG hit, and can still lift several cases of ammo at a time, though with less ease these days. THE LONG TOUR is being put in by the Golden Dragon's wrecker, the oldest in Cu Chi. Mechanics restored it to working condition, but with a profile so that it can no longer leave the Division base camp. Even with its limited range of operation, it is termed "indespensable" by Sergeant Tom Mason of Evansville, Ind., a company supply sergeant for the 2/14. Although the vehicle has threatened to die of old age, it is kept running by "scrounging material," Mason says. THE WRECKERS operator, Specialist 4 Leonard Foster of Plano, Tex., when learning that the vehicle he has been working with for five months was the oldest in the division said, "I believe it." He added though, that "it does its job, usually." It's the only wrecker the battalion has, and there is little hope of getting a new one. With the wreckers tour indefinitely extended, it continues to operate with a shudder, a wheeze, and a hope for one more day. LIEUTENANT Colonel Donald O. Crutchley of Bethesda, Md., has taken command of the 2d Battalion, 14th Infantry, replacing Lieutenant Colonel Constantine Blastos, who spent six months as Dragon CO.
TAY NINH - When a man is assigned to a field unit in Vietnam he doesn't usually expect hot meals while on operations, and looks forward to good old C-rations as his normal bill-of-fare. But cooks of the 2d Battalion (Mechanized), 22d Infantry have improved the situation. MERMITE CANS are used to keep food hot and as serving vessels. The supper meal can thus be prepared in advance on stoves at Fire Support Base Wood III and sent by land or air to men in the field. While this works fine for evening chow, how do you serve a hot breakfast of eggs to order with hot coffee? The raw materials are brought out right along with the evening meal the night before. By filling a portable stove with fuel and sending it along with a cook it is possible to prepare breakfast from the raw materials right in the field. TO SERVE A hot breakfast means the cook is up long before daybreak behind the glow of the fire from the portable stove, heating water for the coffee and preparing the grill for the eggs. Once everyone has moved out for the day's operation, the cook and his equipment go along with them in an APC or return to Fire Support Base Wood to clean up and prepare chow for the troops' return that evening. USARV regulations on positioning of name - and "U.S. Army'' tapes have been changed. In accordance with a Department of the Army announcement, the tapes must now be parallel to the top of the jungle fatigue jacket pockets. Regulation 670-5 adds that combat and skill badges will be placed in normal order, and if there are two or more, the lowest one will be parallel to the ground and with the left edge centered immediately above the highest point of the U.S. Army tape. The USARV announcement said the change will be made by attrition, at no additional cost to the individual soldier. Uniforms on which tapes have already been placed in the old location need not be altered, but all new personnel and soldiers exchanging fatigues should adhere to the changed regulation. TAY NINH - They were just plain old M151-A1 Army jeeps, but the busy 1st Brigade Civic Action section has turned them into a modern combination of a town crier and traveling medicine show. The section's newly organized Remote Broadcast Unit - whose members have been nicknamed "Roadrunners" by their stay-at-home colleagues - provide isolated Vietnamese villagers with an up-to-the-ninute, reliable news source. TWO SPEAKERS powered by a battery amplifier are mounted on the jeep's windshield, and the unit dashes throughout Tay Ninh Province daily delivering its package of current information. "We broadcast three or four hours a day with the two mobile units we now have, and we hope to add another unit very soon," said Specialist 4 George Woodruff, a member of the 6th Psychological Operations Battalion working with the 1st Brigade. "The whole idea is to present news and popular music of the local area for entertainment, then when it's time for commercials, we play prerecorded tapes explaining the different aspects of the government pacification, chieu hoi, or voluntary information programs. We also give out newspapers during the broadcasts." "There is a need to control a crowd in an accident, a fire, or what have you, so the government officials use our unit to help keep order," explained Specialist 4 Don Smith, a member of the Lancer Brigade's Improvement Action Team. Five Tropic Lightning units celebrate birthdays during October. The 2d Battalion, 34th Armor and the Division's Headquarters and Headquarters Company were formed October 1, 1941. The 25th Administration Company was organized Oct. 12, 1943, the 65th Engineer Battalion was formed Oct. 18, 1927 and the 2d Battalion, 12th Infantry Warriors were formed Oct. 20, 1861. This week the Tropic Lightning News introduces you to a new Tropic Lightning feature, Sergeant Certain, the man who gives straight answers to crooked questions. Sergeant Certain, who combines all the endearing qualities of Short-timer Sam and Dear Abby, is well known for his ability to pinpoint the core of a question and then promptly hide it amid haystacks of confusion. And even when he doesn't know anything about the question he's asked, he's always Certain. Dear Sgt. Certain, I am getting pretty short. I only have nine months, days and 23 wakeups to go. Am I entitled to yell "Short" at everybody yet? Just 30,662,568 seconds left. DEAR 30 MILL: ACCORDING TO ESTABLISHED SOP, YOUR STATUS ENTITLES YOU TO YELL "SHORT" ONLY AT VIETNAMESE HOOTCH MAIDS, GIS WHO HAVE BEEN IN-COUNTRY LESS THAN FOUR DAYS AND THE JAPANESE AMBASSADOR. AND IF YOU ARE PLANNING TO EXTEND FOR THREE MONTHS OR MORE, YOU ARE REQUIRED TO YELL "LONG!" EVERY HALF-HOUR. Dear Comrade Sgt., Even though your newspaper doesn't come to me through strictly official channels, I am one of your most faithful readers. And I must say that all of us here at the 49th Bunch (Mechanized), 15th Collection "Charlie Horse" Viet Cong base camp enjoy reading the Tropical Lightning News in between B-52 raids. My question is this: we have been thinking it would be a good idea, in the drive to bring the mutual battle for each other's hearts and minds to a new plateau, to have an R&R exchange. One of our men could go on your R&R program, and we'd be happy to have one of yours participate in our program, which features such choice vacation sites as Peking, the caves of Nui Ba Den, Siberia, Albania, Outer Mongolia and selected areas of Cambodia and Laos. I personally would be interested in an R&R to Hawaii so I could meet my cousin Nguyen, who is a spy currently stationed in Craggy Slopes, Mont. If this can be worked out, please let me know if I would have to wear my uniform black pajamas on the flight or be able to wear my civilian black pajamas. DEAR NGUYEN: A THOROUGH SEARCH OF THE ARS UNCOVERS ABSOLUTELY NOTHING SAYING VIET CONG SOLDIERS ARE NOT ALLOWED TO GO ON R&R, AS LONG AS THEY DON'T TRY TO TAKE ANY GOVERNMENT-ISSUE EQUIPMENT OUT OF THE COUNTRY (SO YOU BETTER NOT TRY TO SNEAK THAT EXTRA PAIR OF HO CHI MINH SANDALS OUT, NGUYEN). SINCE YOU HAVE BEEN IN-COUNTRY FOR 28 YEARS, YOU SHOULD HAVE NO TROUBLE GETTING AN ALLOCATION, EITHER. HOWEVER, I FIND THAT THE VCRS DEFINITELY PROHIBIT "FRATERNIZING WITH EITHER THE CAPITALISTIC, IMPERIALISTIC, MEAN AND ROTTEN WAR-MONGERING AMERICANS OR ANYBODY WHO TALKS TO THEM." YOU MIGHT BE ABLE TO AVOID THIS REG BY CHIEU HOI-ING, AND THEN DE-CHIEU HOI-ING LATER. IN ANY CASE, DON'T FORGET YOUR SHOT RECORD. A MULESKINNER Chinook unloads 15 1st Battalion, 8th Artillery soldiers at Patrol Base Hunsley, and minutes later, another Chinook gently lowers a 300-pound howitzer to the ground, providing Tropic Lightning infantrymen at the base with a near-instant firepower boost. CU CHI - Utilizing its mobility to the fullest, Alfa Battery, 1st Battalion, 8th Field Artillery recently airlifted two howitzers and their seven-man gun crews to a Fire Brigade patrol base in the Ho Bo Woods. The move began early in the morning with the two gun crews and their gear being lifted to Patrol Base Hunsley, manned by the 2d Battalion, 14th Infantry. 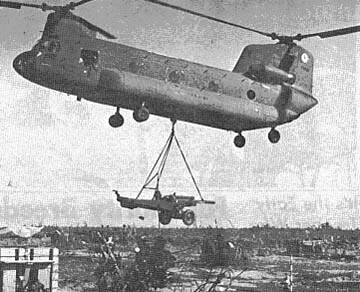 Huge CH-47 Chinooks of the 242d Assault Helicopter Company "Muleskinners" hauled the load. The cannoneers barely had time to clear the gun positions before a second Chinook was inbound with its 7900-pound cargo of 105mm howitzer and "piggy-back" load of ammo and supplies. As the Muleskinners eased their load gently to the ground, the 1st of the 8th artillerymen moved into the powerful downdraft of the aircraft in order to get the gun in position once it was unhooked. By the time the second piece was dropped in, the cannoneers had anchored the first gun, sighted it in and aligned it for firing. Once the artillery was set and cleared for firing, the Fire Brigade Artillerymen began to construct ammo racks, personnel bunkers and parapets for the 105s, a job that lasted on into the night with interruptions for numerous fire missions. The two gun sections of the 1st Battalion, 8th Field Artillery, commanded by Lieutenant Colonel Charles A. Crowe, will mainly be firing in support of the Golden Dragons' Bravo and Delta Companies. PB Hunsley is located in a region of heavy enemy movement, and the artillerymen are hoping to disrupt the hostile activity in the area. GETTING READY - Private First Class Rudy A. Rojas Jr. of Anaheim, Calif., tightens a fuze into a 33-pound high explosive round. 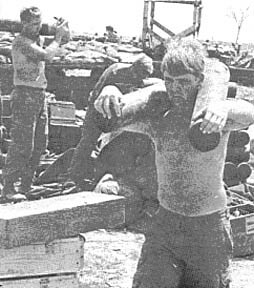 Private First Class Eddie R. Wise of Columbus, Ohio shoulders two "fibers," containers for the 105mm howitzer projectiles and for the cannisters of powder for the round. AIM, FIRE - Specialist 4 Lonnie E. Norman of National City, Calif., (above) looks through his panoramic telescope as he focuses on aiming stakes to level the 105mm howitzer. How Many Dragons Can You Find? CU CHI - It's the early bird that catches a very special worm in a combat zone. And during recent early morning operations dawnbusting Warriors from the Fire Brigade's 2d Battalion, 12th Infantry found their prey totally unaware. The scene was the Citadel area approximately seven miles northeast of Cu Chi, and it was Charlie Company that caught the enemy sleeping on guard. After leaving Fire Support Base Pershing at 4:30 in the morning, the Warrior company completely encircled a hamlet before the villagers had the slightest indication that US troops were present. Private First Class Gene Loving of Chester, S.C. described the incident this way; "Those people were really surprised. Some of them were still asleep when we moved into the village." 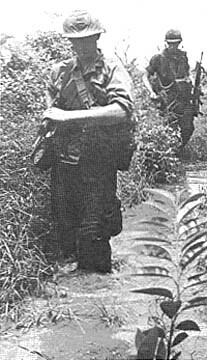 Diligent searching by the Warriors flushed Viet Cong who "came running out of a hedgerow right at us," said First Platoon Leader First Lieutenant James S. Parker of Chelmsford, Mass. "We opened fire wounding both of them." Two more VC were killed during the operation and two AK47 rifles were captured. Two detainees, one of whom proved to be a Hanoi-trained female nurse, revealed to ARVN interrogators intelligence that has proven helpful in subsequent successful Warrior operations. TAY NINH - Teamwork is the key, and together the 7th ARVN Airborne and the 4th Battalion (Mechanized), 23d Infantry Tomahawks are using it to unlock the door to increased success in the area around Nui Ba Den. The two units have been working hand in hand since early September to stifle enemy activity. FIRE SUPPORT Base Rawlins, a long-time Tomahawk stronghold, is being used as Command Headquarters and the operations center for the two battalions. Rawlins and Fire Support Bases Hunter and Bragg IV served as homes for the line companies. Since the first day of combined operations - when Alpha Company Tomahawks and ARVN colleagues lambasted an NVA company on the southeastern base of the mountain, killing 47 - the Allied troops have kept busy harassing an increasingly frustrated enemy. Tomahawk Specialist 4 Michael Hanzal of St. Paul, Minn., says, "These airborne troopers are really up tight. They know how to fight, and we're glad to have them working with us." INCREASING THE number of men operating out of the Allied base has caused a few unavoidable but minor problems. The need for potable water has increased, and more bunkers had to be built. But the benefits have far outweighed the liabilities. As Specialist 4 Robert Kaberlein of Larned, Kan., puts it. "There are bound to be some problems, but a little effort on everyone's part has us functioning as a team." "THE GI'S HERE believe that working together with the ARVNs is another step toward teaching the South Vietnamese soldiers our methods of warfare as well as our learning more about how they operate," Kaberlein said. "We are learning together." 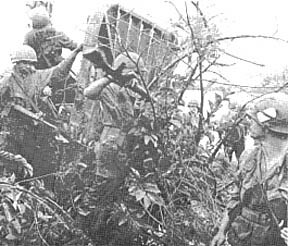 The two units' joint operations are continuing, with ARVN and American soldiers working and fighting side by side. BAO TRAI - A combined operation involving Vietnamese and Tropic Lightning troopers recently uncovered a large enemy weapons cache. Located about ten miles northwest of Cu Chi, the arms were buried in two spots about 1500 meters apart. A HOI CHANH from the Bao Trai Chieu Hoi Center knew the whereabouts of the caches and agreed to lead allied forces to the site. This information was passed on to the office of the Hau Nghia province chief and then to Major Donald Clark of Fort Montgomery, N.Y., 3d Brigade forward co-ordinator. Clark arranged for U.S. support. After being air-lifted to the cache sites, the 198th Regional Force Company swept the area while elements of Tropic Lightning's 3d Squadron, 4th Cavalry provided flank protection. The hoi chanh led the soldiers directly to the weapons and they then returned by helicopter to Bao Trai, where the arms were put on display. THE CACHES included 44 SKS rifles, 14 AK47 rifles, four light machineguns, one 82mm mortar with two base plates and a sight, six rifle grenades, and one antitank mine. A substantial amount of ammunition and web gear was destroyed on the spot. FSB DEVIN - Individual awards for valor in combat have been a traditional and effective means of boosting morale and honoring worthy soldiers. Now in the 25th Infantry Division, valorous actions may be recognized within 72 hours after the action took place. Any soldier in the Tropic Lightning Division deserving immediate recognition may be awarded a decoration even before submission and written approval of the recommendation. under the new "Impact" program. The first award under the program was made by Division Commander Major General Harris W. Hollis at Fire Support Base Devin. Honored were two men from the 1st Battalion (Mechanized), 5th Infantry, First Sergeant Ervin Eisenhauer of Saginaw, Mich., and Specialist 4 Mike Butler of Burbank, Calif., both of whom received Bronze Stars with "V" devices for valor. The Commanding General or an assistant division commander may indicate to the appropriate unit commander his wishes for an immediate presentation. The commander of the unit in contact - battalion size or higher - may also initiate the "Impact" award through the appropriate assistant division commander. 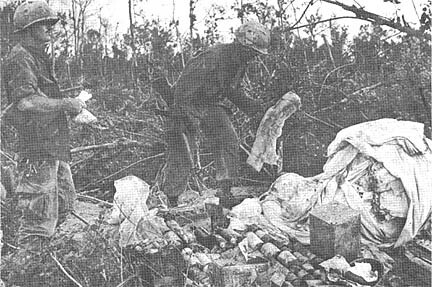 CU CHI - Warriors of the 2d Battalion, 12th Infantry recently unearthed 23 uniform-clad enemy bodies plus a large quantity of medical supplies and clothing during a day of operations in the Boi Loi woods. The airmobile operation brought Warrior Companies Alfa and Charlie into the area to execute a sweep and a detailed search. Alfa Company discovered the graves containing the bodies of enemy soldiers, who had died of shrapnel wounds apparently inflicted by Warrior mortars and the howitzers of the 1st Battalion, 8th Artillery, located at Fire Support Base Pershing. 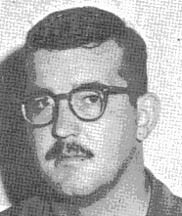 Captain Melvin L. Morrow Jr. of Oxford, Ala., the. Warrior intelligence officer, said of the discovery: "Our artillery is killing more of the enemy than we actually find. Recently we had light contact in that area and it was worked over pretty well with artillery and mortar fire. Occasionally we discover the results." A cache of medical supplies was found near the grave site. It included a surgical kit, 120 penicillin vials, 50 vials of vitamins, 10 rolls of adhesive tape and 12 pounds of gauze. At the same time Company C was executing a cordon and search operation about 500 meters to the south. The first platoon began a detailed search of a wooded area nearby. A 50-gallon drum containing 150 complete NVA uniforms was found buried in a pit covered by a trap door. Sergeant David Abernathy of Hutchinson, Kan., stated "The trap door was almost perfectly concealed. Most of us had already gone past it when our Kit Carson Scout spotted it."